We were riding the crest of a wave. This wave started nearly a month ago, with the NPD group putting out a release that said Android had outsold the iPhone in the first quarter of 2010. As Android users, we were happy. We were proud. Though Apple shrugged these numbers off, we wouldn’t have any of it; Android fanboys came out of the woodwork, touting our open-source playground and taunting iPhone users with our ability to run multiple apps. We held up our Droids and our Nexus Ones and our numerous other models, saluting that little OS that had finally scored a major victory against the Apple juggernaut – or so we thought. After some new numbers from Nielsen (you know, the marketing guys who monitor cable and radio ratings), that wave has come crashing down. As illustrated by the graph below, Android only holds a 9% market share in US smartphones; though it has grown 2% in the last quarter, it still remains fourth overall. 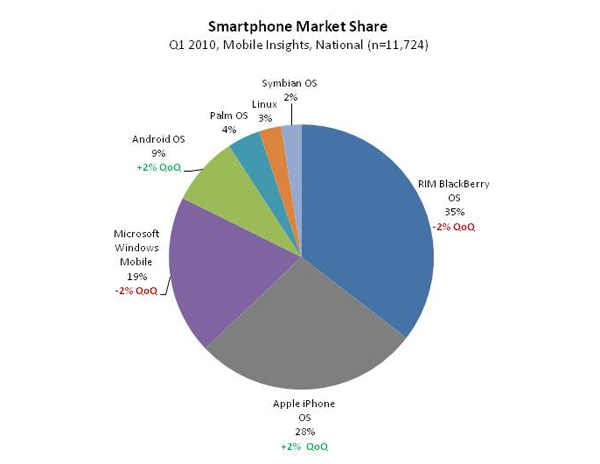 RIM’s Blackberry holds a 35% share (down 2%), while the iPhone comes in a close second with 28%. 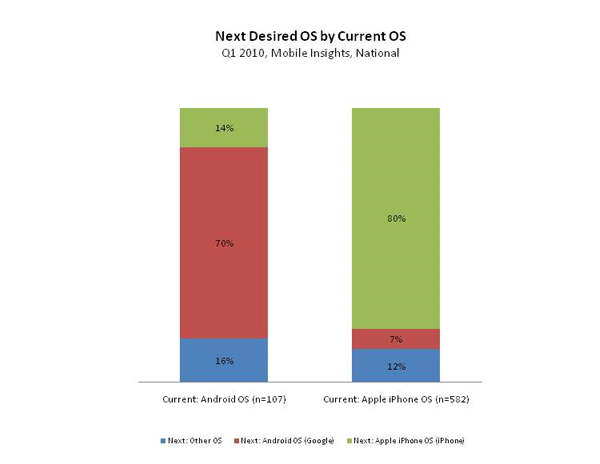 Even the much-maligned Windows Mobile platform holds a 10% lead on Android. Things won’t be getting any better, either: RIM is releasing a new version of their Blackberry OS in the coming months, keeping the platform attractive to the massive corporate market that it caters to. Windows Phone 7 remains on the horizon, and Apple will be launching their newest iPhone hardware this week. Coupled with iPhone OS 4.0, this new tech will take away much of fanboys’ ammunition: the iPhone will finally be able to run multiple applications at once, store icons in folders and customize aspects of its look. And you know what? I couldn’t be happier. In fact, I welcome the challenge. Instead of being concerned with who can yell the loudest, Android will be judged on its own merits and succeed or fail accordingly. When those NPD numbers came out showing we had bested our chief rival, the Android communitys’ collective heads swelled a little. They became overconfident. Google I/O came and went, and they basked in our victory, as well as the ones surely to come. They watched Froyo run laps around the iPad without wondering why an iPhone wasn’t up on the stage, as well. They took jabs at “the other guys”, without thinking of when they might shut them up. Now the numbers have been released and the community has (hopefully) been humbled a little bit; it can now go back to the task at hand: rising up once again. Platforms are not made solely by the fans that enjoy them: like it or not, a product that lacks quality will fail, no matter how many people support it. It is up to the developers of Android (from Google to that guy coding apps in his basement) to make the platform attractive for nerds who love every last bit of what’s inside their phone to the moms and dads of this world who are just looking for something easy to use. There is good to come from these numbers, though: 70% of surveyed Android users said that their next phone would be an Android, as well. This shows a trust in the platform that is building, and one that can hopefully be built upon. Brand loyalty is a powerful tool, especially when Android has such a diverse array of hardware to consider: it shows that users are happy with the system they are using, independent of what the phone manufacturers might be offering.